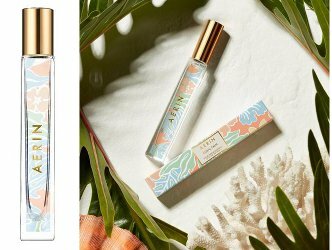 Aerin has launched Coral Palm, a new limited edition fragrance for women. Coral Palm captures the beachy sun-kissed attitude of Aerin’s Palm Beach lifestyle—sunny days, indigo nights, the bright blue sea and sky and glorious coral sunsets. Citrus top notes of Bergamot and Sicilian Lemon sparkle with Freesia Petals and Dewy Greens, merging easily with a heart of Tuberose, Ylang, Golden Gardenia and Heliotrope. The final creamy, rich nuances of Coconut Milk, Cedarwood and Vanilla trail behind. A balmy, tropical blend as warm as the end of a perfect Palm Beach day. Aerin Coral Palm is available in an 8 ml Eau de Parfum rollerball, $30. I love the idea of this cute little rollerball and the notes sound appealing for summer. But that’s what I thought when I read about Hibiscus Palm and I hated it. Not sure I’d like this any better. Fortunately, I hardly ever do blind buys! They did a pretty rollerball for the Hibiscus Palm too. This one sounds almost like Bronze Goddess, which I do like better than any of the Aerin scents so far.